One common question recruiters ask prospective employees is how many gas stations there are in the United States. The number isn't important to the recruiter since he/she would like to know if the job seeker can come up with the number through reasoning. If you want to shine at the job interview, you should answer 121 446, which was the number of public US gas stations in 2012. The point of this article will not be the gas station, but what we can learn from the rise and fall of the gas station and if we can draw parallels so the number of electric charging station. As the global supply of oil decreases, as we saw in the article Oil since 1859, the world has to replace the cars powered by gasoline with cars powered by electricity. The best thing would be if we could begin to replace our cars before the supply of oil begin to decrease, as the Norwegians have begun to do. Their goal is to have is to have 100 000 electric cars in Norway within year 2020, which is the same year as many believe peak oil will happen. The problem is that many people are negative to electric cars and their main argument is that the number of electric charging stations is far fewer than the number of gas station and it will be difficult to build as many charging stations as we today have gasoline stations. To find out if this is true, we have to go back to the days when the first oil well was drilled. The first oil well, drilled in 1859 in Titusville, US, had a depth of 66 feet [20 m]. From these first wells, the oil flowed and it became common to see large black pillars of oil shooting up from the ground when a drill struck oil. This new type oil from below the ground was originally used for lightning lamps. It was easy to find new wells, so the oil flooded the market. In 1900, 34 percent of the cars in New York, Boston and Chicago were powered by electric motors – the rest were powered by a steam or a combustion engine. Manufactured in the late 1800s, the first electric cars were quiet, smooth, clean, and could be charged in the home. In 1899, the torpedo shaped electric car, The Never Satisfied, was the first vehicle to reach a speed over 62 mph [100 km/h]. Those who witnessed the record thought they were going to die if they traveled so fast. While Henry Ford mass produced gasoline cars, his wife Clara Ford drove a 1914 Detroit Electric with a range of 80 miles [130 km] and a speed of 20 mph [32 km/h]. As the new oil flooded the market, the gasoline cars began to outnumber the electric in 1920. One reason was because they were easier to refuel – in most smaller towns in America, the gasoline car arrived before electricity. The gasoline car was also less expensive – the price of Ford's Model T was just one third of the price of an electric car. The first public gas stations were called filling stations and they began to appear in 1907. 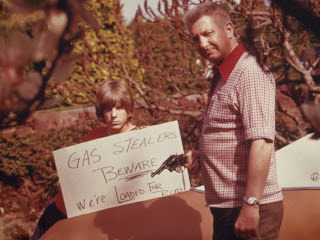 They were the first real gas stations with an dispensing pump connected to an underground storage tank. Car owners had earlier purchased gasoline through shops that handled the gas as a side line to other business activities. By 1920, the filling station was often a small building with gas pumps in front. They offered supplies like tires, batteries, and oil, and simple services like lube jobs and tire patching. 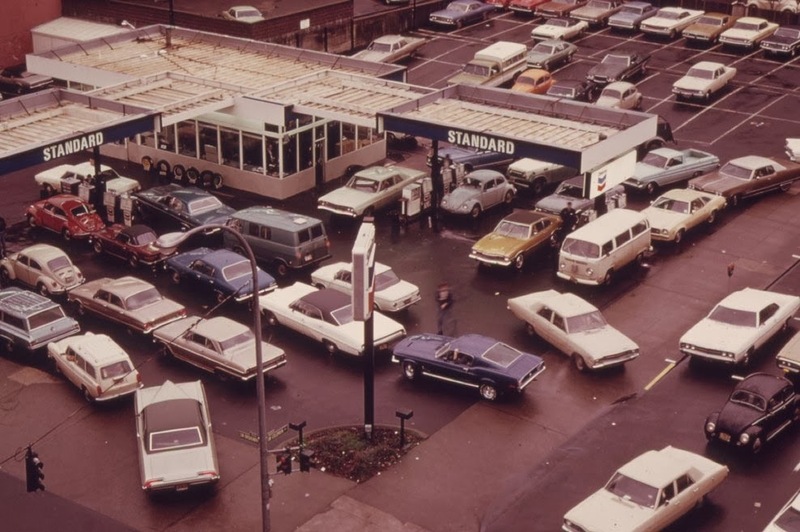 As the number of gasoline cars grew, so did the number of gas stations. In 1920, US had 15 000 gas stations and by 1930, US had over 100 000 gas stations. 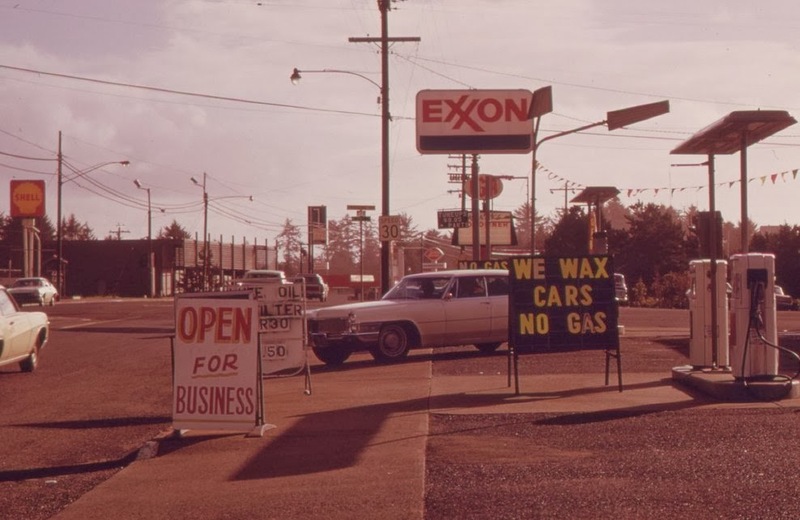 In 1970, the number of gas stations in US had grown to 200 000. But then, in 1973, the world experienced a larger oil crisis. Several oil exporters from the Middle East limited the supply of oil because US supported Israel during the Yom Kippur war. The price of oil skyrocketed. Gas stations had to shut down because no oil was available, so people began to steal gasoline. The above chart also shows the number of charging plugs and stations in the US. Starting in 2011, electric charge equipment was counted by the plug rather than by the geographical location, so that's the reason to the increase in 2011 and 2012. But if we draw a parallel to the increase of gas stations, we could see that the number of gas stations grew from 0 to 15 000 in 13 years as the demand for them grew. The easiest way to charge an electric vehicle is to do so in the garage during the night. But everyone doesn't have a garage. So what we have is a chicken and the egg problem. People want to buy electric cars if they can charge them, but to build more charging stations, we need more electric cars. To overcome this problem without using taxpayers money, someone has to take the lead, and that someone today is Tesla Motors. They are building a network of charging stations despite the fact that they are only selling 20 000 electric cars each year.